The best thing about being a sports fan on the West Coast: Every game comes on three hours earlier. I watched a 12-inning Boston-Oakland game Tuesday night that ended at the totally reasonable time of 11:29 p.m. Had I stayed up for that one on the East Coast, I would have been dead for work the next day. Oh, wait, I don’t have a real job. Bad example. But you get the idea. Now, I’m not good in the morning. I am surly and unfriendly. My brain doesn’t work very well. I’m not coherent until somewhere between the 8-ounce and 10-ounce marks of whatever coffee I’m drinking. But even I could put those pieces together. News about Kevin Garnett’s knee had finally leaked. The Celtics were screwed. Rob King wanted me to write about this as fast as humanly possible. I e-mailed Rob back and asked if I could just type the word “Whhhhhhhhhhhhhy????? ?” over and over again. He said no. I called my dad, hoping for a Confucius-like take on the whole thing. He used a three-word sentence that started with “We are” and ended with a six-letter word that I can’t print. I called my buddy Sully, a longtime Celtics employee, hoping for a soothing reaction like, “He’s fine, this whole thing is overblown.” Straight to voicemail. I called Sean Grande, the radio play-by-play guy for the Celtics, hoping for some inside info. Straight to voicemail. I called my buddy House, hoping for a “You’ll be fine, you can win without him” take from a neutral observer. He volunteered that, “You have no chance of beating Cleveland now.” Thanks. So I chugged down my coffee and here I am. I have four reactions and only four. I was given 150 minutes to write them. Here you go. 1. On paper, the Celtics were the only Eastern team that could realistically consider unseating Cleveland in a seven-game series. The odds weren’t good for two reasons. First, it’s going to be near-impossible to win a Game 7 in Cleveland with the way LeBron James feeds off a frenzied crowd that’s in “Maybe if we shower him with love, he won’t leave in two years mode” (like a high school junior who starts putting out because her boyfriend is leaving for college in a few months). Realistically, you’d have to beat them four out of six times; the Lakers have a better chance because of the 2-3-2 format. In Boston’s case, the Celtics have a sizable obstacle: With James Posey gone, Paul Pierce is the only Celtic who can guard LeBron. For one game, he can do it. In March, he masterfully outplayed LeBron on both ends in Boston. Thirty-six hours later, the Celtics hosted Orlando for a Sunday afternoon game and Pierce was dead. He had nothing left. Celtics play-by-play announcer Sean Grande joins Bill to discuss Boston’s chances of defending its NBA championship. At age 31, with nearly 900 games on his NBA odometer, you cannot ask Pierce to carry the Celtics offensively AND defend a physical freak like LeBron seven times in 14 days without a ton of help. It’s just too much. If Garnett, one of the greatest help defenders of all time, was backing him up? Maybe. But not Glen Davis, Kendrick Perkins, Leon Powe and Mikki Moore. Pierce’s only chance to survive and thrive for a seven-game bloodbath of a Cleveland series — and by proxy, Boston’s best chance — would be for the Celtics to immediately hire Brian McNamee, Victor Conte and Kirk Radomski as “team consultants.” Not a bad idea, actually. Anyway, about four weeks ago, it became clear that we were headed for a Cavs-Lakers Finals unless Garnett came back. Vegas had 6-to-5 odds for this matchup happening. Those odds were too high. By last week, they had shifted to 4-to-7 — less than even odds — meaning that you had to risk $700 just to win $400 back. 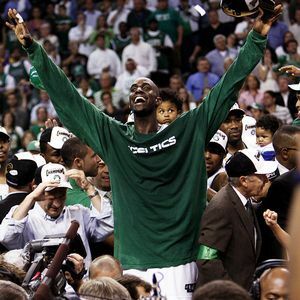 And this was with everyone assuming Garnett would come back. By Friday, I predict that those odds will shift to 2-to-5. I cannot remember heading into a playoffs in which the Finals matchup was more of a sure thing. If Cleveland loses to a KG-less Celtics team, it would rank among the biggest chokes ever. Ditto if the Lakers fall to any of the motley crew of contenders in the West; after digesting Wednesday night’s games, I am now down with Ric Bucher’s theory that young Portland might be the only team that could unseat them. Portland??? Exactly. Why fib the truth? Because it’s the smart move. You don’t want the Cavs and Lakers thinking, “We’re going to cruise to the Finals.” You also don’t want your best players (Pierce, Allen and Rondo) thinking, “We are screwed” in March, and you don’t want your young bigs (Perkins, Powe and Davis) to be thinking, “The burden has shifted to me, I gotta come through!” They played it the right way. I do believe that the team believed Garnett was — eventually — coming back for Round 2 or the conference finals at less than 100 percent and would play through whatever pain because he’s a warrior. If they didn’t believe that, they wouldn’t have greenlighted a playoff sales campaign that involved his picture and giant banners hanging on various Boston streets. Ugh. So they were undeniably blindsided by this latest news. On the other hand, again, they knew he was injured and that wasn’t as simple as “fix this ligament” or “fix this bone chip.” Which meant all bets were off. What remains amazing was the media’s willingness to accept Boston’s strategy that could only be described as “stringing everyone along.” Garnett didn’t have an identifiable injury. This wasn’t a case of “he tore his MCL, he’ll be back in four weeks” or even “he’s got some bone chips in there, we might have to clean them out.” Really, the dude just has old knees. He put too many miles on them and played with too much intensity for too long. When the knees go, they go. That’s just the law of the NBA. It’s as simple as that. There’s a hidden sub-story lurking here: It involves the fall of newspapers, lack of access and the future of reporting, not just with sports but with everything. I grew up reading Bob Ryan, who covered the Celtics for the Boston Globe and remains the best basketball writer alive to this day. Back in the 1970s and early ’80s, he was overqualified to cover the team. In 1980, he would have sniffed out the B.S. signs of this KG story, kept pursuing it, kept writing about it, kept working connections and eventually broken it. True, today’s reporters don’t get the same access Ryan had, but let’s face it: If 1980 Bob Ryan was covering the Celtics right now, ESPN or someone else would lure him away. And that goes for the editors, too. The last two sports editors during the glory years of the Globe’s sports section were Vince Doria and Don Skwar … both of whom currently work for ESPN. For the past few years, as newspapers got slowly crushed by myriad factors, a phalanx of top writers and editors fled for the greener pastures of the Internet. The quality of nearly every paper suffered, as did morale. Just two weeks ago, reports surfaced that the New York Times Company (which owns the Globe) was demanding $20 million in union concessions or it’d shut down the Globe completely. I grew up dreaming of writing a sports column for the Globe; now the paper might be gone before I turn 40. It’s inconceivable. But this Garnett story, and how it was (and wasn’t) covered, reminds me of “The Wire,” which laid out a blueprint in Season 5 for the death of newspapers without us fully realizing it. The season revolved around the Baltimore Sun and its inability (because of budget cuts and an inexperienced staff) to cover the city’s decaying infrastructure. The lesson was inherent: We need to start caring about the decline of newspapers, because, really, all hell is going to break loose if we don’t have reporters breaking stories, sniffing out corruption, seeing through smoke and mirrors and everything else. That was how Season 5 played out, and that’s why “Wire” creator David Simon is a genius. He saw everything coming before anyone else did. Ultimately, Garnett’s injury doesn’t REALLY matter. It’s just sports. But I find it a little chilling that the best player on the defending NBA champion could be sidelined for two solid months, with something obviously wrong, and nobody came close to unraveling the real story. We still don’t know what’s wrong with his knee. We just know it’s screwed up. And, yeah, you could say that Garnett has always been guarded — with just a few people in his circle of trust — and yeah, you could say that only a few members of the Celtics organization know the truth (maybe coach Doc Rivers, GM Danny Ainge, majority owner Wyc Grousbeck, the trainers and that’s it). But this was a massive local sports story. Its coverage is not a good sign for the future of sports journalism or newspapers in general. 3. The big picture outlook for the Celtics: If Garnett needs reconstructive surgery or (I can’t even type the word … dammit) microfracture surgery, they’re absolutely screwed. Garnett’s three-year, $56.5 million extension doesn’t kick in until next season. For the 2011-12 season that might not happen if there’s a lockout, he’s owed … (gulp) … $21.2 million. The Celtics took great pains to structure player contracts so that Ray Allen’s deal ($18.7 million) expired after the 2009-10 season, Pierce’s ($21.5M) expired after 2010-11 and KG’s ($21.2M) expired after 2011-12. The thinking was, “That’s our foundation, and for three straight seasons, we can either negotiate extensions or shop these guys as expiring deals.” Garnett’s knee, if damaged, throws that plan out the window. Even this summer, with the cap going down and Garnett’s future in jeopardy, the team now has to overpay to keep Davis — whose play improved markedly over the past three months — and also needs to ink Rajon Rondo to an extension. They’re looking at a payroll of more than $80 million in 2009-10 (and a luxury tax penalty of $12 million, plus all the tax money they’d miss out on) if they want to keep this season’s team intact. Yikes. My dad and I had the same conversation five times in the past month, as it became clearer and clearer that Garnett was more injured than the team was saying, and we had it again today: Was one title (and a memorable season) worth giving up Al Jefferson, a few first-rounders and Ratliff’s expiring deal that maybe could have been used to trump the Lakers for Pau Gasol? Yes. Yes it was. The goal is to win the title. We won a title. I would do it again. There is no statistic to capture the effect Garnett had on the rest of these guys; they played with a collective heart that reminds me of only one other Celtics team. Which brings me to my final point. Now that, my friends, is a title defense. Mike Fine was the first writer to mention the similarities between the 1986-87 Celts and 2008-09 Celts in the “What else can go wrong?” sense; I was furious I didn’t think of it first. The other thing those teams had in common: a refusal to quit or make excuses. This season, Garnett disappeared but Powe and Perkins stepped up, then Davis did the same when we lost Powe. Pierce played the best all-around basketball of his life, and that’s saying something. Allen played brilliantly this season — remarkably efficient, repeatedly clutch — and reinvented his career in a historical sense. The young guys played with particular purpose and pride. If there was a defining Celtics game this season, it was Game 81: The No. 2 spot already clinched, Allen suspended, no reason to try at all … and yet there was Pierce submitting another world-class performance (31 points, 12-for-16 shooting, defended Andre Iguodala all game) and leading them to a road win over a Philly team that desperately needed the game. You know who deserves more credit than anyone? Doc Rivers and his coaching staff. It’s hard to keep a defending champ motivated; it’s really hard to keep them focused without their leader; and it’s REALLY hard to keep them consistently good as you’re constantly integrating new guys into the rotation. Currently, the Celtics have three guys (Stephon Marbury, Mikki Moore and Davis) who weren’t in their nine-man rotation at the start of the season. They haven’t missed a beat. They finished with 62 wins, and honestly, I don’t know how they got there. There was no bigger Doc critic over the years than me, but the man was unbelievable this season and defended his guys vociferously every time they were getting screwed by calls. He had the single hardest coaching job in the league. Period. And he delivered. I have to hand it to him. Because of Pierce, Garnett and Allen, and Doc as well, it’s a proud Celtics team that cannot be counted out. If there was ever a team built for “Nobody Believed In Us” status, it’s the 2008-09 Boston Celtics. They will miss Kevin Garnett, but I guarantee you that everyone on that team believes — from Doc on down — that they can make the Finals and win. I am dubious. Very dubious. But I do know they will kill themselves trying. Regardless, it’s a sad day and not the way I wanted to start my morning. Whether you love the Celtics or hate them, you have to admit, the playoffs would have been more entertaining with KG involved. He will be missed.